Indeed she is, often with candor, fearlessness and a conviction that is undiminished. There is something remarkable about a person who follows her passions to the ends of the Earth, regardless of the natural talent (or lack thereof) bestowed, and Florence Foster Jenkins – a real woman who rose to notoriety for those reasons in the 1940s – was the embodiment of that realization. But this new movie revolved around her enduring fame is not a happy portrait of a figure unburdened by the hard edge of criticism; it is a sad retelling, showing a woman who used the stage as a means to silence the nagging alarms of her demise, which seemed as imminent as the likelihood of sunrise. A 50-year patient of a then-fatal ailment known as Syphilis, her physical fragility loomed without mercy, and throngs of loved ones were a reprieve from the emotional darkness. And it was the theater that gave her spirit a sense of purpose, where she put nearly every dime of her small fortune into furthering the cause of the arts over her short but prosperous lifetime. Why did her legacy survive so prominently, though, when the conventional wisdom is that great talents are the ones destined to transcend? Why did her famous performance at Carnegie Hall in 1944, for example, persist with such fascination for future generations of listeners? Stephen Frears’ film works through the motions of a perceptive screenplay by Nicholas Martin to discover such an insight. It gives us a window into this woman’s world that is not glossed up in formalities or carried by the winds of high society arrogance – that would be too narrow an impulse. The film stars Meryl Streep in the title role, which is sound for two primary reasons: 1) Streep has the versatility to emphasize both the greatness and the vulnerability of such an identity; and 2) she can undertake the task without calling too much attention to melodramatic cues. Her Foster Jenkins emerges in the early scenes as a figure of prosperity that is idolized by spectators belonging to an elusive club of opera enthusiasts, many of whom arrive early on to catch a performance of “Ride of the Valkyries” directed by both she and her husband St Clair (Hugh Grant), the man who encourages her impassioned commitment. That the production itself is shabby beyond comprehension is a moot point for its audience – they love these performers so dearly they see only captivation, even as the details seem to blend into a clear acknowledgment of mediocrity. Behind the curtains of Florence’s ambitious charades, meanwhile, there is dialogue that sheds light on a variety of life experiences. As energetic and loving as she remains on stage, she is actually dying – a fact revealed silently as St Clair casually removes her wig after falling asleep. Increasingly tired and not optimistic about her own endurance, she suggests wanting to return to the stage by herself – to sing, specifically, which she has not done in many a year due to her health. To get in the best shape for such an undertaking, however, requires the hiring of professionals to assist in creating a captivating concert. 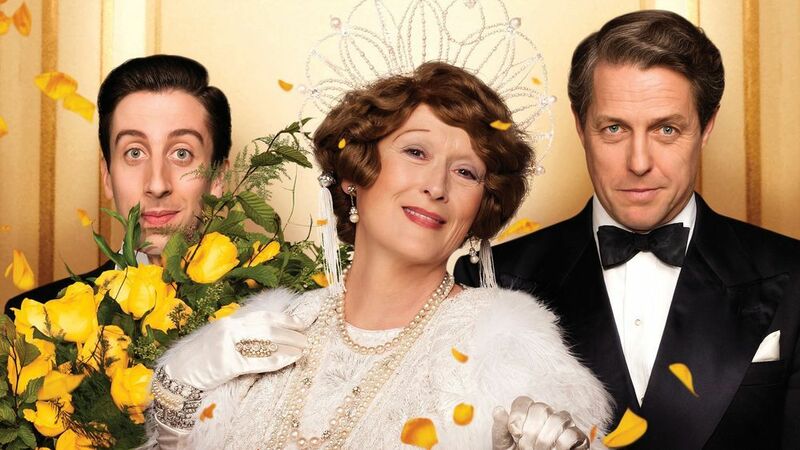 That includes a pianist named Cosme (Simon Helberg), an outsider with awkward presence who is jazzed by the notion of playing for the great Florence Foster Jenkins. Unfortunately, during early recitals with a patient vocal coach, Cosme’s baffled reactions reflect those of the movie’s audience: as outsiders it is clear to see that Florence’s aspirations are foolish, because her endeavors lack pitch, consistency and tone. They are the vocalizations of a woman who lived decades never knowing how bad she was. Yet no one in her inner circle – even a prominent vocal coach – ever suggests how embarrassing this undertaking has the potential to be; they simply nod and smile, offering light applause and lavish praise even as her voice croons beyond the jagged edges of listenability. Of course movies tell alternate versions of what the reality usually was, and “Florence Foster Jenkins” deals with this certainty with some level of creative ambition. How does an awful voice like this one make it that far without weathering outside criticism? The story argues that St Claire – a devoted husband, minus a girlfriend on the side – was instrumental in ensuring that any of his wife’s public appearances were only seen by those who would cheer them on. That meant few members of the press were ever allowed to attend, unless they were easily bought by money or prestige. One holdout in the early scenes – a reporter from the New York Post – exists for narrative contrast, of course, because the plot must use him later on, when Florence decides to have another concert at Carnegie Hall and give away tickets without her husband’s usual filters. Many of these situations must build for the sake of walking that shaky tightrope of keeping poor Mrs. Jenkins away from criticism that may unravel her lifelong fantasy, but no movie of this nature could survive without it. An audience is made to care about this kind of situation for a plethora of reasons, not the least of which is a convincing argument as to why this woman deserved a shining moment on stage in front of applauding onlookers. We do not arrive at sympathy or attachment based simply on the matter of the situation, mind you. The key to our involvement emerges from the bonds between Florence and her closest loved ones: a husband so devoted and loving that he dares not expose her to emotional turbulence; a dedicated doctor who watches over her bedside with consistent wisdom; a housekeeper that offers affectionate glances between discussions and delegation; and a young piano player with big professional dreams who is torn between the embarrassment of the situation and the loyalty he comes to discover in his association. The actors in those roles meet Florence’s gaze with such unwavering joy that there is no doubt in their authenticity, and Streep amplifies their energy so ambitiously that she is elevated above the details in a performance with heartbreaking clarity. Less capable thespians would have allowed their screenplays to escalate and manipulate the emotions of their audience, but such is not the case in these capable hands. There is a sense that all involved understand the positions of their characters, especially in a world where it is so easy to get lost in the thundering roar of a cynical world that refuses to let a gentle soul bask in the glory of their own passions. If the movie itself doesn’t always take off with these virtues, it’s because it wavers in matching that underlying pathos with dramatic balance. As well-modulated as many of the actors are here, most of them can’t resist being swept up in the current of a narrative that must put so many of them in many of the typical contrivances of melodrama – including the obligatory climax in which an embarrassing situation must inevitably be subverted by the brave act of another. Likewise, the resolution is inconclusive and sour, and though Florence attempts to wrestle the perspective back in a poignant moment of dialogue, the sentiment is lost in a real downer of an ending, which is far too abrupt to leave one contemplative of Florence’s strange legacy. What we do learn, perhaps, is that one’s love of a profession can be the fuel for any goal, including an unwavering dedication that is worthy of some level of acknowledgment. Talents, at the end of the day, are secondary. It takes a much bigger person to stand in front of a crowd of onlookers with a face so brave, and an even richer spirit to do so while refusing to accept physical limits.